I have worked out how to do this, objects in the game and is a rubber chicken, just need to get rid of the bone shadow and recolour! And see if I can make the animations better when the dog plays with it! So there's something I've been wanting to do for a year now, but always run into a massive (literally) problem. The object I want to make is a Rubber Chicken dog toy. 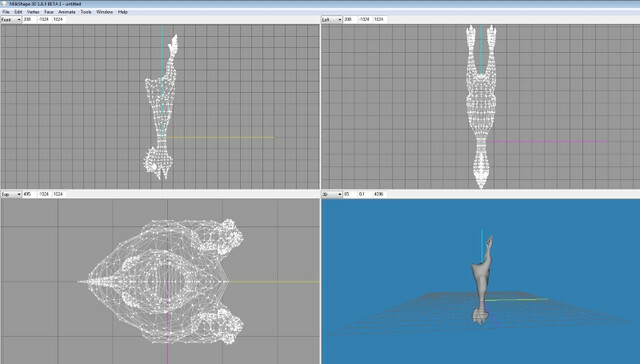 Have the mesh loaded up to milkshape but its huge and vertical. I'd like to make it just a lil bit bigger than the dog bone (what I'm cloning it to) and have it lying horizontal. Been looking at countless tutes and I can't seem to work out how to do either! I'm sure it's something pretty simple and once I click I think (hope) will be away laughing! Any help would be appreciated! ekrubynaffit, proud to be a member of LeeFish since Sep 2012. Thanks Lee, am redoing from scratch what I had done as I think it was too small, but now can't remember what I did last time lol!! This is why I should write things down, going to go get a cheap notebook tomorrow to keep sims notes in!! So do you need help with this still?